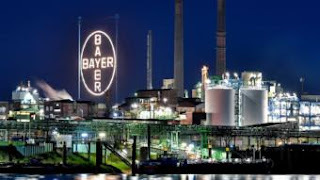 Shares in German pharmaceutical group Bayer have dropped sharply following a US verdict linking a product to cancer. By mid-morning on Monday, Bayer's shares had lost 10.4% of their value. Bayer owns agriculture giant Monsanto - which was ordered by a California judge on Friday to pay $289m (£226m) damages to a man who said ingredients used in a weedkiller had caused his cancer. Bayer says the product - glyphosate - is safe. It completed its $66bn takeover of Monsanto in June.